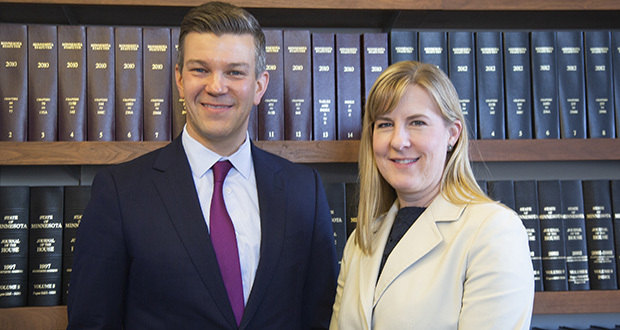 Minnesota House Speaker-designate Melissa Hortman, DFL-Brooklyn Park, and incoming Majority Leader Ryan Winkler, DFL-Golden Valley, will be the first lawyers since 1987 to hold the House’s two top leadership posts. Not that the University of Minnesota Law School grads are making a big deal of it. “I don’t know that it’s important to have two lawyers at the head of the class,” Hortman said during a Nov. 13 interview in her office. Winkler also was present. They are, but to a lesser degree than at any time since Grover Cleveland was president. Lawyer-legislators once were a dominant Capitol faction; in 1918 there 66 of them. There will be just 21 legislators who list their occupations on the Legislative Reference Library as attorney, lawyer or prosecutor next year; 12 in the House and nine in the Senate. That’s the smallest contingent since the 1895-96 biennium, according to the Legislative Reference Library. Since 1987, four lawyers have served as speaker. Paul Thissen, now a state Supreme Court justice, was the most recent in 2013-14. Over the same span, four attorneys also have been majority leaders. Attorneys Phil Carruthers and Bob Vanasek held both posts. The last time lawyers held both top slots was in 1987. Paul Godfrey, the Minnesota State Bar Association president, said he is glad to see a replay of that scenario on the horizon. While there are fewer lawyers in the Legislature these days, five were newly elected this year. Hortman said that those who run usually have the same reasons attorneys always had for seeking elected office. Winkler, a tech-company general counsel in his professional life, said attorneys have a natural tendency to lead at the Capitol, regardless of their numbers. Hortman replaces Rep. Kurt Daudt, R-Crown, as speaker. She first popped into public view as a young lawyer working her first jury trial back in 1997. There she won a $490,181 civil award for Stormy Harmon, an African-American mother of three who accused landlords of housing discrimination and emotional distress. Though later reduced on appeal, it was then the largest such award in state history. “That’s how I got into this mess in the first place,” Hortman joked. She lost, but eventually got elected in 2004. Since her second term, Hortman has never been out of her caucus’ leadership mix. Besides serving as Energy Policy Committee chair in 2013-14, she has been an assistant majority leader, minority whip, speaker pro tempore and deputy minority leader. In 2017-18, she was House minority leader. Winkler, who will replace retired Rep. Joyce Peppin, R-Rogers, as majority leader never held a leadership post or committee gavel in his five previous House terms. But his presence nonetheless loomed large. A progressive champion of the poor and campaign finance reform, Winkler often used a quick, biting wit to deflate opponents’ arguments on the House floor. When he resigned in 2015 after his wife took a job in Belgium, Thissen—then House minority leader—lamented that Winkler’s “impatience with injustice” would be missed. Not anymore. After flirting with a run for attorney general last year, Winkler switched and ran for his old District 46A House seat and won. His caucus then elected him majority leader. Hortman and Winkler both think their lawyerly experience will serve them well in leadership. Perhaps lawyering did help prepare her for governing, though. As an employment litigation attorney, Hortman said, she worked as both a plaintiff’s attorney and defense attorney. She learned to reason through both sides of arguments. That mindset helps her deal with Republicans, she said, and will impact her approach to the speakership. The speaker is the House’s principal leader and administrator. Speakers direct legislative strategy, rule on parliamentary questions, appoint committee chairs and members, sign legislation and communicate most directly with the governor and Senate leadership. The majority leader deals with day-by-day legislative operations, runs caucus meetings and schedules the daily calendar. Often with the help of party whips, the majority leader enforces discipline on crucial votes. However beneficial it is to have lawyers in those top slots, it’s no guarantee of success. That was demonstrated in 1987, the last time it happened. Fred C. Norton, the House speaker that year, was a gentle, soft-spoken man who contemporaries compared to TV’s Mister Rogers. Bob Vanasek, a moderate former Republican, was majority leader. Though a good legislator, Norton turned out to be a fairly feckless speaker who sometimes lost control over his House, according to contemporary news reports. Rebellious conservative Democrats once hijacked a stormy caucus session and demanded that Norton trim his tax and spending targets by $200 million; to save face, he acquiesced. Weeks later, House Republicans spontaneously launched a rare, five-hour filibuster, seizing control of the floor after Norton let DFLer bring a defeated bill on color-coded election ballots back to the floor. Rudy Perpich tapped Norton for the Minnesota Court of Appeals in May 1987, leading critics to snipe that it was the only graceful way to can Norton and elevate Vanacek to the speakership. Norton served on the Court of Appeals until his 1997 retirement. But it’s hard to see a scenario like playing out under Hortman, who showed a capacity to whip the body into shape even as minority leader. In a much publicized 2017 incident, she spotted white male lawmakers playing poker and watching a Twins game in the House retiring room. Angered, she demanded that they march back onto House floor and listen to female legislators as they spoke out against a freeway protest bill. They did. On the other hand, she said that she will schedule more bipartisan activities and foster collegiality between the caucuses. And she will direct committee chairs to avoid constructing Omnibus Prime-styled mega-bills like the one Gov. Mark Dayton vetoed in May, she said. Still, she intends to stick by promises she made from the stage during a DFL rally on Election Night. The House will pass gun safety legislation, she said. It also will pass universal health care, fully fund schools and restore the state’s air and water quality. It’s a big agenda, but she thinks she and Winkler can steer it through. While both new leaders think their experience as attorneys will be helpful in their new jobs, Winkler senses a limit to that. The Legislature is not a courtroom where lawmakers simply try to win over a jury of voters, he said. Lawyer-legislators: Who’s in, who’s out? Six lawyer-legislators who were present for roll call at the start of the 2018 session will not return when the next session starts on Jan. 7. Five others attorneys, including returning Rep. Ryan Winkler, were newly elected. Here’s a who’s in/who’s out list of lawmaker-lawyers at the state Capitol. The 16 incumbent attorneys who remain in office are not listed.